Serotonin is a monoamine neurotransmitter that is biochemically derived from tryptophan and produced in serotonergic neurons in the central nervous system and in enterochromaffin cells in the gastrointestinal tract. Serotonin is important in the regulation of mood, sleep, vomiting, sexuality, and appetite. Low levels of serotonin are associated with several disorders, including depression, migraines, bipolar disorder, and anxiety. Its actions are terminated primarily via uptake of serotonin from the synapse. 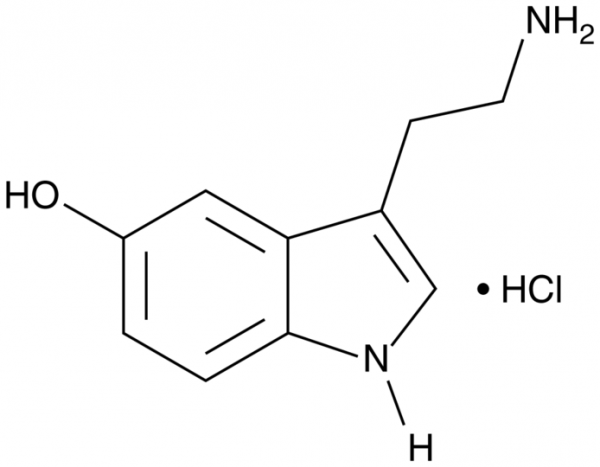 Serotonin reuptake can be inhibited with MDMA, cocaine, tricyclic antidepressants, and selective serotonin reuptake inhibitors. Customer review for "Serotonin (hydrochloride)"